A couple of weeks ago, G & I jetted down Asheville for the first ever Mountain Oasis Festival. A weird mash-up of electronic and indie bands, I had no idea what to expect from the whole experience, but, thankfully, it ended up being a blast and totally worth it. By the time tickets were available to purchase, smart people had already booked all the hotel rooms and nothing remotely affordable was available in town. AirBnB to the rescue! We stayed in this cozy townhouse about 1/2 a mile from the Orange Peel and, other than the insane cold snap that weekend that made walking a little miserable, had no complaints. Another win for AirBnB; I’ve yet to have a bad experience! That first night was freezing (literally–lows were in the 20s…in October…dear god…) Our first stop was for dinner before the festival started and it needed to be something relatively quick. I remembered that the last time we were in Asheville, Farm Burger, an Atlanta-based local-meats ‘fast food’ish chain, was building out its space. 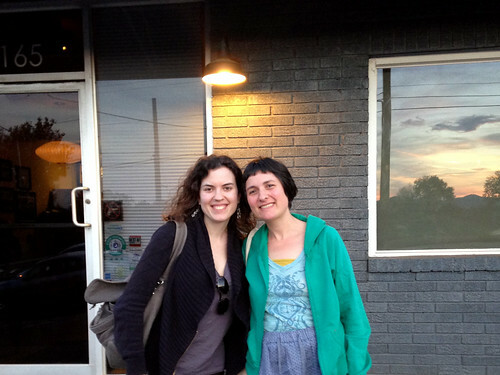 The restaurant was on the way to the venue so, voila, Atlanta goodness in Asheville! 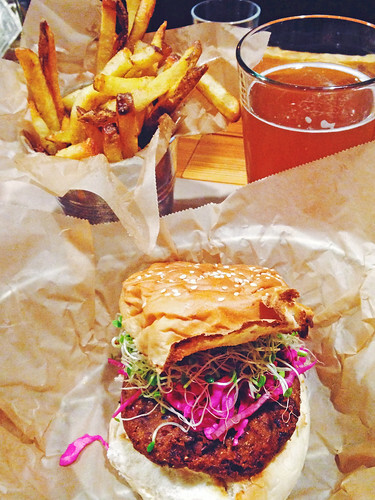 hara smoked tempeh, black eyed pea burger; clover sprouts, pickled onions, red cabbage, basil tofu spread. Hello vegan burger goodness. It was definitely the best vegan burger I’ve ever had the pleasure of eating–the red pea, tempeh, and black bean burger was meaty and dense–not too mushy and ‘vegany’, and the basil tofu spread was creamy and rich and just perfect. Plus it was a huge burger. Like, how do I stuff this in my face burger? The fries were super crispy and potatoey too, a perfect accompaniment. Post-burger pig-out, we were off to one of the highlights of the festival: Half Japanese, Daniel Johnston, and Neutral Milk Hotel! (Plus a little Purity Ring in the middle.) Half Jap was awesome, pictured 1st, (apparently we saw them in England at ATP? Totally don’t remember) and played a solid old-school set. Daniel Johston, no photo, was quirky and everything I could have hoped for…such a crazy story, go watch The Devil and Daniel Johnston if you haven’t, great documentary. 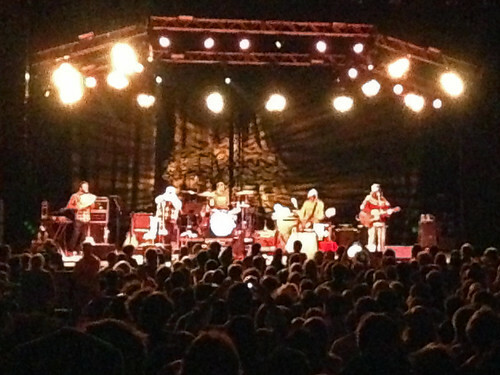 And John Mangum/Neutral Milk Hotel. (2nd photo) Ok, yes, I know, it’s my fifth time seeing him perform live (Athens, twice at ATP, Charlottesville), and I’m NM’ed out now, BUT, to watch his evolution as a performer over the last 18 months or so? Insane. He even allowed photos. All other shows, no cameras allowed. And he’d kick you out if you tried to take a cell phone picture. This time? Photos. I know. It’s crazy. 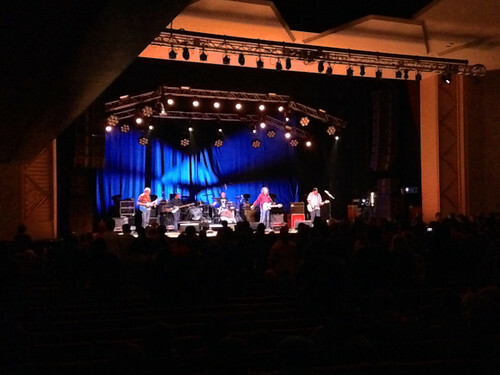 He’s very much more a performer now, a lot more confidence, and the set with the whole band was nice, but I missed some of the original-ish members and regretted seeing some (that old dude who opened for him in Athens…I’m getting seriously pissed just thinking about him…). Over all, though, a great show and a great way to say, “Ok, I’ve seen Jeff grow up, get comfortable with making money/being popular, and he’s there.” In a way it was a nice goodbye to seeing them live. The next morning, brunch at Mayfel’s which…well..wasn’t as good as last time. 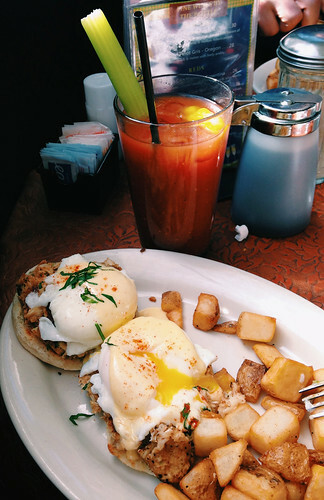 My crab cake benedict was still good, it just wasn’t mindblowingly good. Afterward we walked around, looked in shops, and I got cranky and needed a nap. 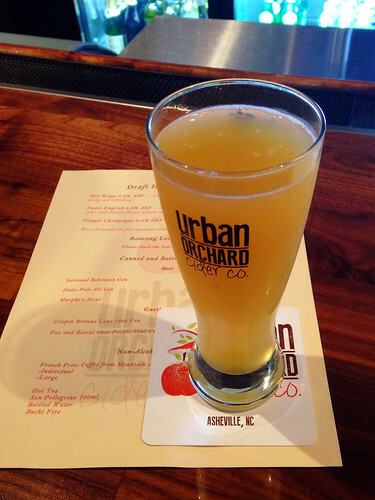 But, afternoon rolled around and we wanted a drink, so we headed over to one of Asheville’s newest places to drink–Urban Orchard. I heard about Urban Orchard via Melina who posted about their opening night on Instagram (also, check out her blog, it’s amazing and you’ll fall in love with her life, writing, and photos), which was literally three days before we checked them out, and, dang ya’ll, get yourselves there. The apples are grown just outside of town (Hendersonville) and pressed, then transferred to the bar location to brew into delicious, crisp, apple-ful cider. We sampled all three available–Dry Ridge, English Sweet, and Ginger Champagne–and settled on pints of the Sweet English. And, yes, the Ginger Champagne is indeed sparkling–sparkling cider spiked with fresh ginger. Seriously good too. Day drinking moved to evening drinking (and amazing eats) with a pre-planned blogger date with Becky of Glue & Glitter at Plant! We’d originally wanted to meet up for lunch, but it turns out that Plant no longer offers their amazing lunch (with it’s out-of-this-world reuben), a serious diss to all vegan food-lovers in Asheville. So an early dinner it was! Dinner started with a little amuse bouche of pickled carrots, but quickly moved into appetizer territory with Becky’s house cheese platter and G & I’s order of fried plantains. 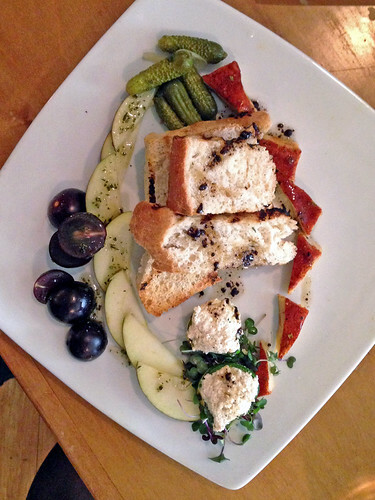 The cheese plate was ridiculously good–it was hard to tell that it was even vegan cheese!–with the house made raw ricotta and a fermented cashew gouda (per Becky’s notes), pickles, fruit, and crusty bread. 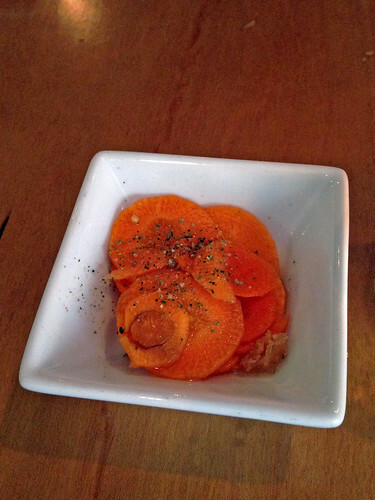 I think the cashew gouda was my favorite–slightly smokey, tangy, and with a great texture. 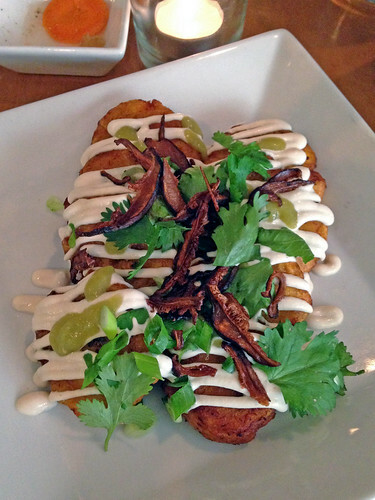 My fried plantains were also crazy good–and super spicy! The salsa verde packed a serious punch while a cashew-based cream (I think) added a much needed tangy, cooling element. And on top? SHIITAKE BACON. Um, yes please. And, you guys, it seriously tastes like and has the texture of crispy bacon (and I eat bacon now, so you can take my word for it). I mean, if someone says they can’t be a vegetarian/vegan because of bacon, just slide them a plate of this stuff. It’s amazing. Now I just have to figure out how to make it. For main courses, both Becky & G ordered the Hazelnut Crusted Seitan with whipped cauliflower, grilled rapini & romesco, pickled onions, and more of that awesome shiitake bacon. I’d wanted to order it too, but that seemed ridiculous–three people ordering the same main course–and opted for something different–but, dang, I kind of wish I’d just ordered this one. The seitan was crispy fried and the whipped cauliflower has me on a quest to make my own. I guess I always knew it could be as delicious and rich as mashed potatoes, but I’d never eaten it before. The verdict? A fantastic non-starch alternative. But that’s not to say that my entree wasn’t fantastic as well. The Smoked Portobello Steak with chard & garlic, crisp loaded polenta, tomato-fennel salad, and v1 steak sauce is an amazing dish packed with tons of hearty flavors. 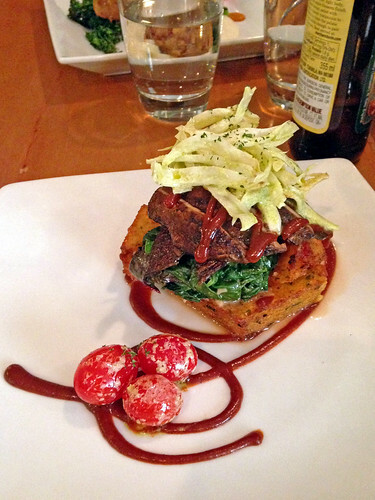 I don’t know what was in that loaded polenta, but it was amazing and I loved the crisp-fried exterior. As for the smoked portobello, it was everything you’d want in a traditional ‘steak alternative’. Gorgeous plating too! Post-dinner we parted ways to catch different shows at the festival and I had a really fun night roaming between venues, dancing around a little, and gawking at all the fun Halloween costumes. Gary Numan? Amazing to see live. He played a little too much new stuff (which is ok since it’s not bad), but I would have loved to hear more vintage Gary Numan. I also noticed that he has a serious duck face while performing? Why, Gary, why? 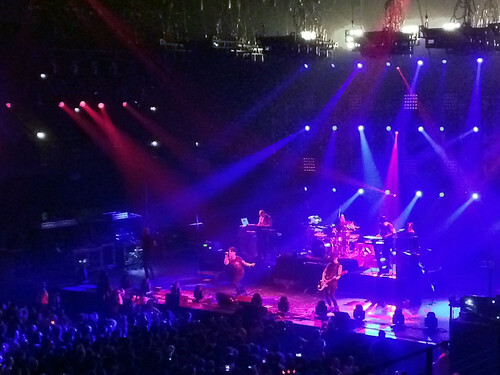 Nine Inch Nails was our other biggie of the night and, damn, great show, but, damn, why so loud? We actually had to leave after a few songs because of G’s ears (damaged from noise so he’s really sensitive for fear of hearing loss). 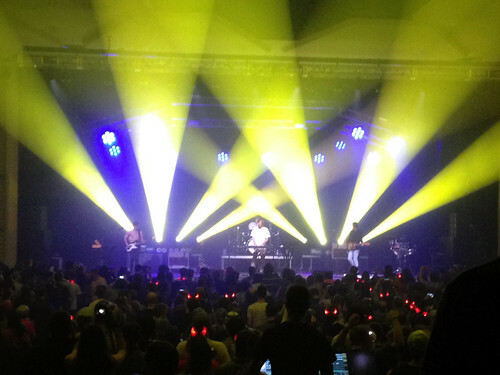 Epic lights, epic noise, but just way too much for us. 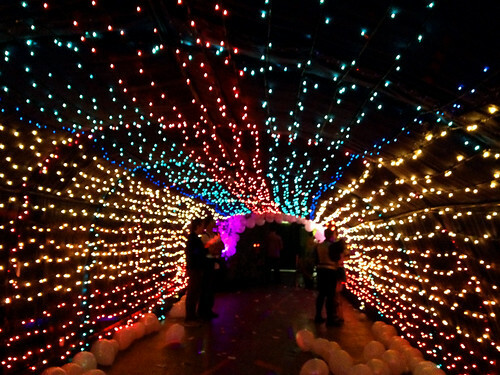 The magic tunnel though? Just perfect! 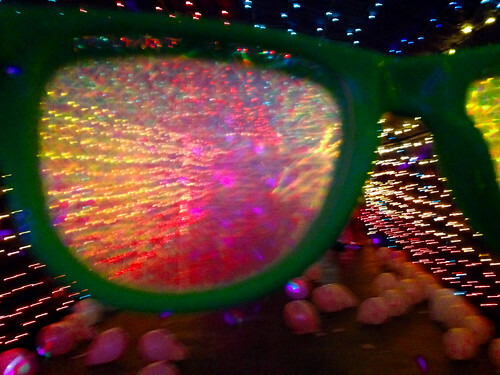 I love how trippy it was when you put the special glasses on. Totally a Disney World for grownups like Becky said. 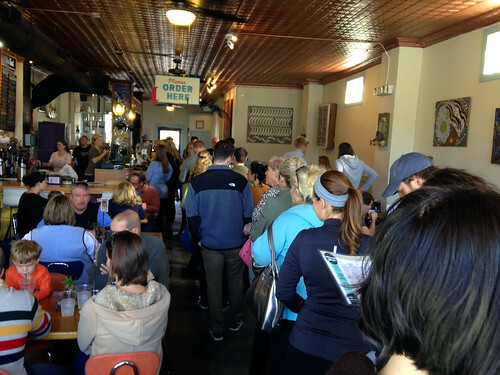 Sunday morning featured the most incredible brunch experience of my life (minus the whole no-alcohol-before-noon thing Asheville has going on…) at Biscuit Head in West Asheville. I was a little terrified upon realizing that the line stretched from a counter up front out the door but, believe me this, totally worth it. And the line actually moved pretty quickly (and there were enough seats for everyone which seemed a minor miracle). Let’s talk for a minute about biscuits in Roanoke–there are no good ones. I’m pretty sure every restaurant here buys their biscuits from Sysco, sticks them in the oven, and serves them. They all taste the same. Which is to say gross. Biscuit Head’s biscuits? Breath of fresh butter. 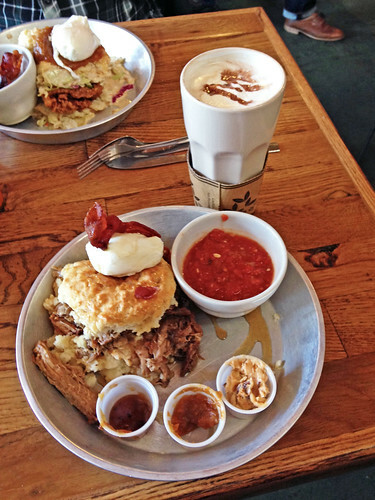 I ordered the Pulled Pork Biscuit with pulled pork, jalapeno pimento, bacon, poached egg, and maple syrup. There’s also a shot of smoked tomato creole gravy on the side. And a crazy-rich mocha with house-made chocolate milk. I couldn’t eat for the rest of the day. And I was so much more happier for it. The pulled pork was juicy and tender, the jalapeno pimento tangy and sharp, and the egg just sauced it all up. No need for the gravy on the side, though I didn’t mind its spicy kick. They also have a little biscuit bar in the back with various jams, jellies, and syrups to add to your biscuit. I kindof fell in love with the balsamic jelly. I think I need to make that happen soon. Basically, don’t miss out on Biscuit Head, it’s my new favorite obsession restaurant. Stuffed, we wandered around to record stores and then spent the afternoon watching our respective football games at Wild Wing Cafe, a great little sports bar near the Orange Peel. If you’re into sports bars, you’ll love Wild Wing–it’s cozy yet with a bajillion TVs and everyone is super friendly. 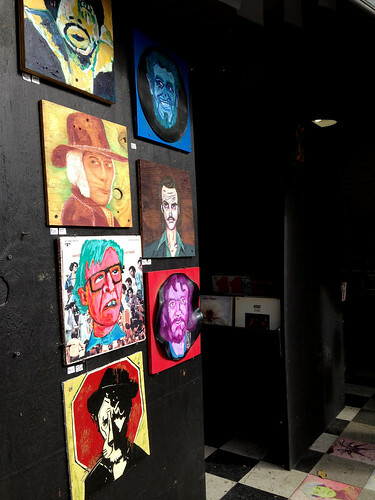 Plus they have a great craft beer list with tons of local brews; what’s not to love? We caught Mount Kimbie at the Orange Peel afterward and then, somehow, managed to get hungry enough to eat a dinner snack before some other shows. 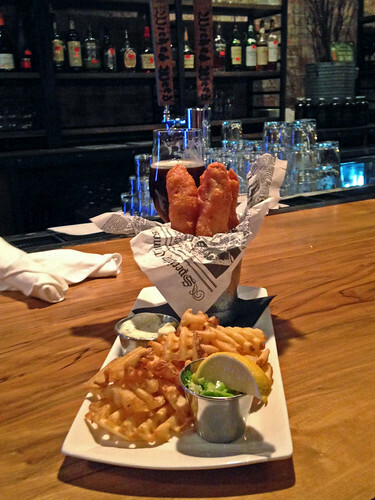 Thus we sauntered next door to Wicked Weed Brewing for some drinks and their (should be famous) fish & chips. Fried to crisp perfection with some tasty fries, though it’s listed as a small plate, don’t shy away from it if hungry. And if you’re lucky enough to try the Apple Pie Saison, it’s fall in a glass. It’s amazing. Next up, the final shows of Mountain Oasis and, most notably, Cut Copy and Pretty Lights. I wasn’t sure what to expect of either show and I ended up loving both. Cut Copy is really fun, dancy music and I think I’d definitely catch them live again if given the opportunity. 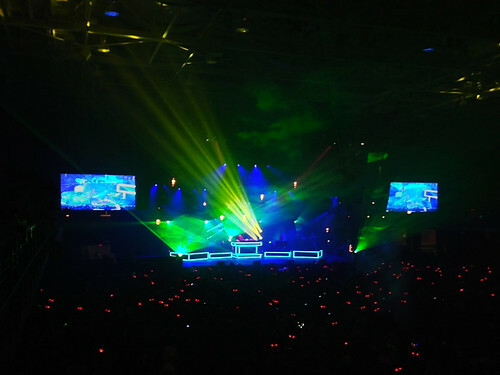 Pretty Lights featured, obviously, pretty lights, as well as some sweet music. We only stayed for a few minutes of that set because of G’s ears, but I would have loved to have caught the entire thing. Not necessarily my ‘typical’ sound, but one that I do find really fun and upbeat. After a bagel (Sausage, Egg, Smoked Gouda And Pesto on Everything Bagel) at Clingman Cafe in the River Arts District (cute little coffee shop and a good bagel) and a peppermint mocha to-go, it was time to race back to Roanoke and a half day of work on Monday. An epic festival. 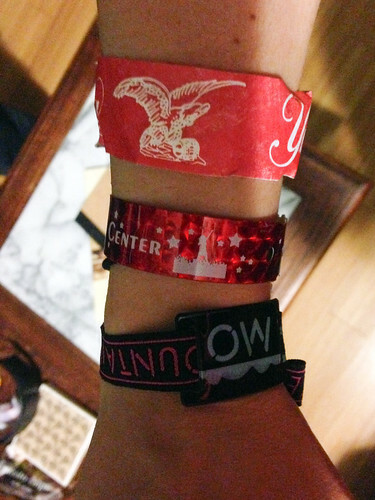 And one with way too many uncomfortable wristbands. God I keep thinking about that meal. I’m so glad we got to meet up! 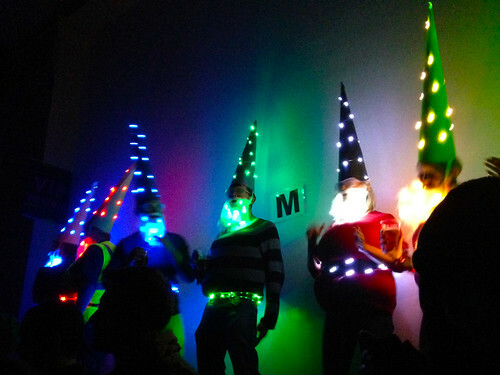 I love your gnome photo. Those guys were so good! 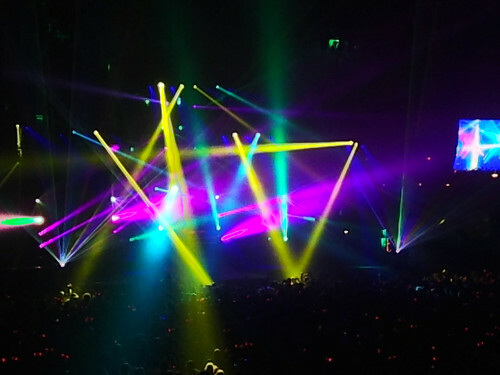 Pretty lights blew me away too. I hope they come through Atlanta! You guys clearly have the most fun on the weekends. Also, this reminds me that I need to make a new batch of carrot pickles immediately! Whoa. You guys put our couch-potatoing, lazy-snacking, pajama-wearing weekends to shame! 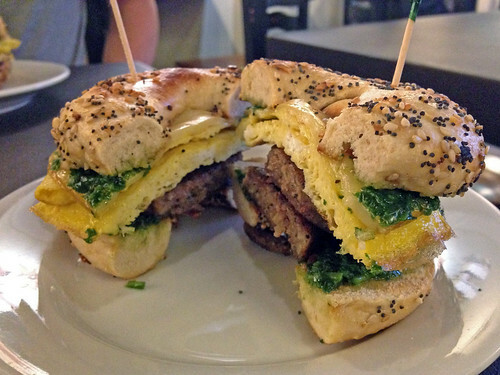 The vegan burger from Farm Burger looks awesome. 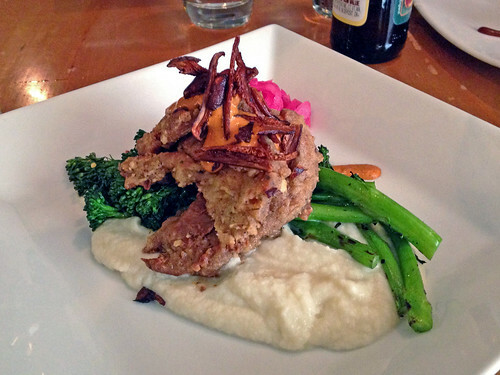 And the hazelnut crusted seitan!! Whoa again.